The Weight of Weight Stigma - Marci R.D. The following post was written by Elizabeth Jarrard, RD. Sticks and stones can break my bones but words will never hurt me. Right? Words like “fat” “obese” get tossed around a lot in our society. Unfortunately they are often also associated with words like “gross” or “lazy.” These words do hurt. The stigma of weight hurts not only the person at which they are directed, but our society in general. 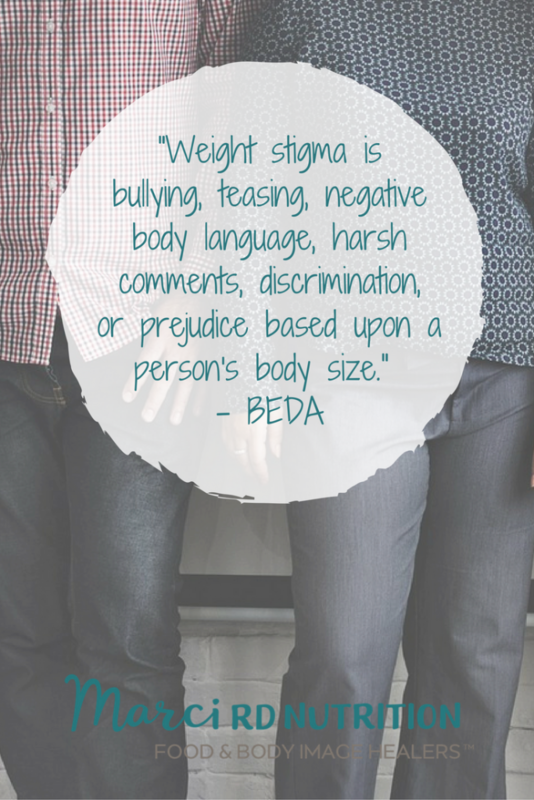 Weight stigma and bias can be verbal (insults, teasing, stereotypes, or derogatory names) or physical-bullying. We now see that discrimination based upon weight is more prevalent than race discrimination-with a 66% increase over the past decade. “There’s an atmosphere now where it’s O.K. to blame everything on weight,” said Dr. Linda Bacon, a nutrition researcher. Research suggests images in news media of obesity extremely negative, biased, & stigmatizing- which creates prejudice. In some cases stigma results in employment discrimination where an obese employee is denied a position because of their appearance regardless of their qualifications. This isn’t just a few people-43% of overweight people report weight stigma by employers or supervisors. Recent research has highlighted just how deeply weight stigma runs-and it’s not just in job interviews or promotions. According to Huizinga et al The higher a patient’s body mass, the less respect doctors express for that patient. Weight stigma is a significant risk factor for depression, low self esteem and body dissatisfaction. Victims of weight stigma have increased levels of stress (seen explicitly in cortisol levels and increased blood pressure), decreased desire to exercise. This creates a negative life environment that may perpetuate cycles of overeating and under exercising-creating an unhealthy lifestyle. 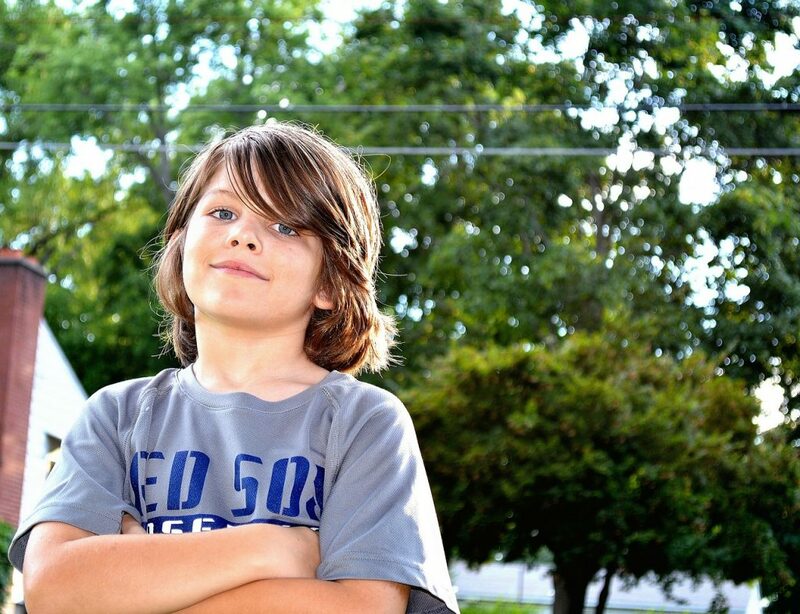 No matter what size he or she might be it’s important that you talk to your child about weight stigma and foster within them a positive self esteem. Help us all to create school environments that are conducive to learning-by reducing weight stigma. Are you a health provider? Talk to your patients without weight stigma. Yale Rudd Center is a fantastic resource for all providers. As an employer-make sure you are not perpetuating weight stigma. Just because someone is overweight doesn’t mean they don’t exercise, they don’t eat healthfully or they are lazy. Stop those you see using weight stigma and bias. Change the stereotypes within your own mind. We must learn to take a Health at Every Size approach and treat all individuals the same-whether they are our clients, our friends or just people we meet on the street. Weight is a number, and you can not tell someone’s entire life or health history from judging their outward appearance.